The Ecological Niche Modelling Workflows offer an extensible framework for analyzing or predicting the impact of environmental changes on the distribution of biodiversity. Especially in combination with data aggregation workflows like the Taxonomic Data Refinement Workflow, the Ecological Niche Modelling workflows facilitate the analysis of species distribution patterns over large geo-temporal, taxonomic, and environmental scales. Examples for applications are studies of species adaptations to climate change, dynamic modeling of ecologically related species, identification of regions with accumulated risk for invasion, potential for restoration, or natural protected areas. 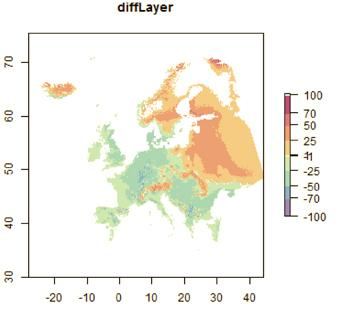 The Ecological Niche Modelling (ENM) Workflow offers a framework to study geographic distributions of many species under various climatic scenarios. ENM uses associations between known species occurrences and environmental variables to calculate areas of habitat suitability for a species using statistical correlation models. This workflow can be accessed through the BioVeL Portal here and here (with remote data input). The BioClim Workflow is usually run before the ENM workflow to select environmentally unique points from a specified set of points and to calculate the corresponding environmental envelopes (minimum/maximum) for the given environmental variables. It is a variation of the ENM workflow. This workflow can be accessed through the BioVeL Portal here. The ENM Statistical Difference Workflow (ESW DIFF) is used for post-processing of the outputs from the ENM workflow. This workflow can be accessed through the BioVeL Portal here. The ENM Statistical Stack Workflow (ESW STACK) is used for post-processing of the outputs from the ENM workflow. This workflow can be accessed through the BioVeL Portal here. The input file contains species occurrence points. The ENM workflow takes as input a file containing species occurrence points to create an ecological niche model with the openModeller Web Service. Algorithm, environmental layers and geographic area are selected during the workflow. The model is tested (internal test and optional cross validation external test) and then projected one or more times. All points from the input file are used to create a single model, even if there are differences in the scientific names. The BioClim Workflow creates an ecological niche model with the openModeller Web Service using the BioClim algorithm. Environmental layers and geographic mask are selected during the workflow. Points are filtered so that only environmentally unique points are used to create the model. ESW DIFF computes the extent and intensity of change in species potential distribution through computation of the differences between two raster layers. ESW STACK computes the extent, intensity and a cumulated potential species distribution by computing the average sum layer from a set of given input raster layers. These workflows have been developed to be run in the Taverna automated workflow environment. In their current form, the workflow files (with the .t2flow extension) can be loaded and executed in the workbench variant of Taverna. They have been tested with Taverna Workbench version 2.4. These workflows can also be run in BioVeL Portal, a light weight user interface which allows browsing, reviewing and running Taverna Workflows without the need of installing any software.